Details: Full color, 192 pages, TPB, 7" x 10"
The team is despondent following the near apocalypse created by one of their own and the death of their beloved mentor Pogo. So it's a great time for another catastrophic event to rouse the team into action. Trouble is -- each member of the team is distracted by some very real problems of their own. The White Violin is bedridden due to an unfortunate blow to the head. Rumor has lost her voice -- the source of her power. 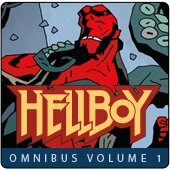 Spaceboy has eaten himself into a near-catatonic state, while Number Five dives into some shady dealings at the dog track and The Kraken starts looking at his littlest brother as the key to unraveling a mysterious series of massacres . . . all leading to a blood-drenched face-off with maniacal assassins, and a plot to kill JFK! 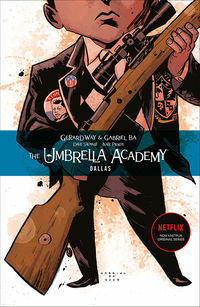 In my opinion Dallas is the funnier of the two Umbrella Academy issues. A continuation of the first book in a different way but again , a worthy read with visuals to match the fast pace of the story. Amazing art. 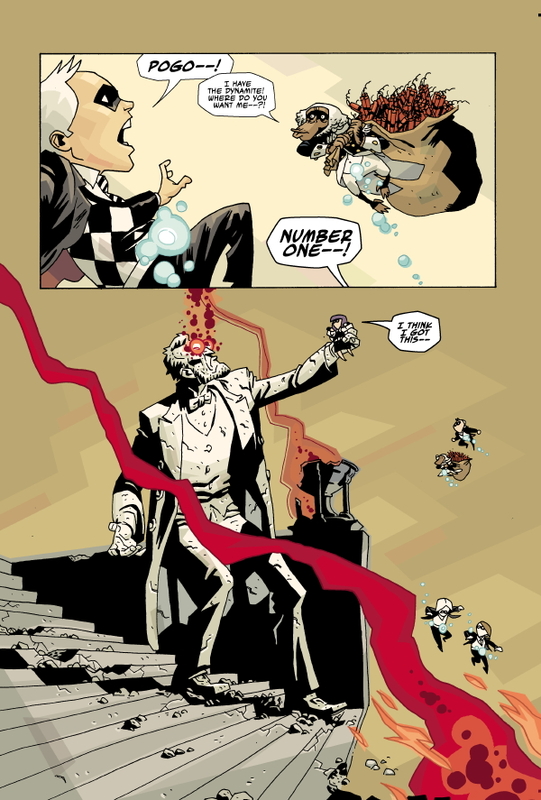 Umbrella Academy was the reason why I now love comics. Althought it's obvious that the storyline was carefully elaborated, it is not noticeable at all because it is so fresh. As soon as you finish the last chapter and realize the awesomeness of what you just witnessed, you're left wondering how those things exploted like that in your head. This is an amazing story. It keeps up with Apocalyse Suite's vibe. The story just captures you and you cant stop reading. The art by Bá is quite impressive and inspiring. There is'nt much "behind the scenes" things but what few things that it does have is so incredible. im so greatful that the pages are numbered. I kept getting lost in TUA: Apocalyse Suite. "Dallas" is an amazing follow-up to "Apocalypse Suite". 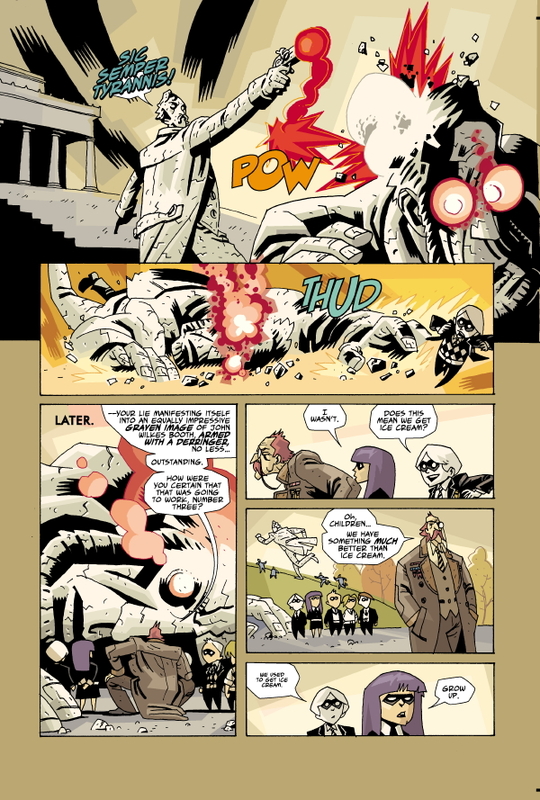 Where the first book was somewhat of a tease, showing us glimpses of what kind of composition would be possible using these characters, this style and this plot as written and illustrated by Gerard Way and Gabriel Ba. "Dallas" on the other hand, was Bethoven's 5th. With blood and candy. The Umbrella Academy has truly come into itself with this book. I loved reading this as an all-in-one format, saving my comic books! 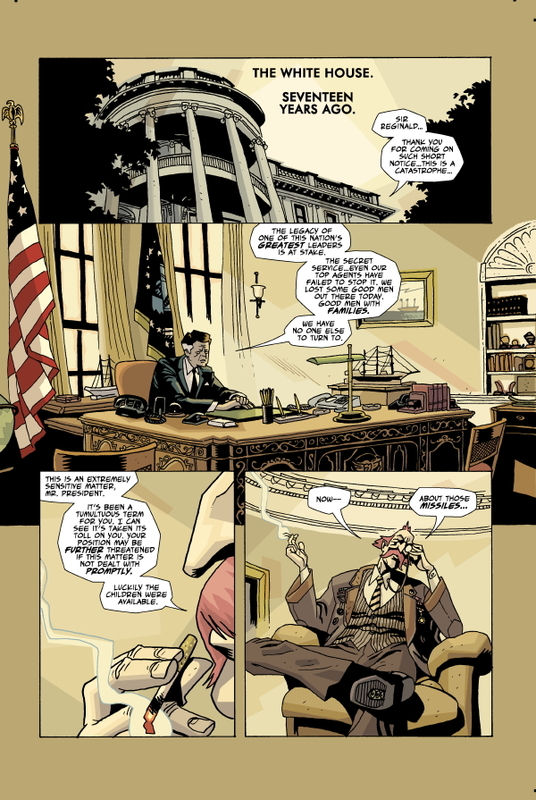 As With the original Umbrella Academy series, this is a fab story, very well written, and most enjoyed. Everything about this story is rad. From despondent team members, to Vietnamese vampires, to homicidal maniacs who dig thin mints, this book has it all. 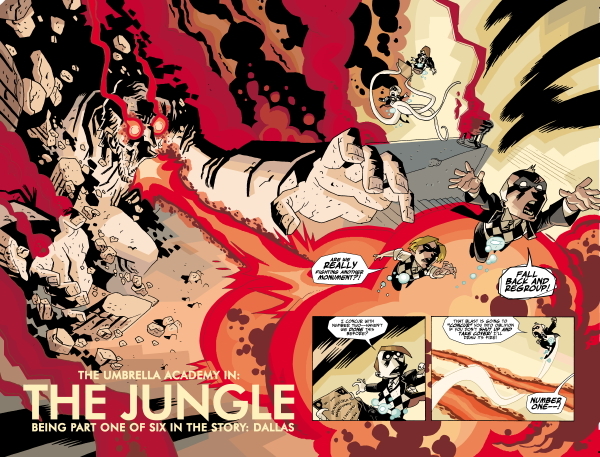 We learn more about most of the members of The Umbrella Academy, and we find out where #5 did when he ran away from home. Dallas is the book where nothing is changed, and the team saves the world. Legal Notice: Entire contents trademarked (® or TM) and copyrighted (©) 1986-2019 by Things From Another World, Inc. and respective copyright and trademark holders. All rights reserved. Page rendered at 2019-04-25 21:23:09 in 0.259 seconds.